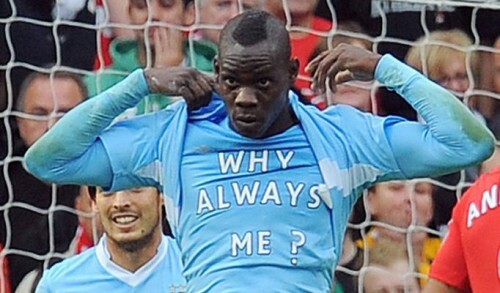 How Do You Solve a Problem Called “Balotelli”? The enigma that has gripped English football in the Premier League this season has been anything but controversy free. There have been many eye catching issues ranging from the Suarez race saga, the alleged John Terry racial slur, right down to the debatable suspensions of prominent footballers in high profile teams. Forget about Carlos Tevez going on strike. Added to the mix is the fact that with the help of television and the benefit of replays, English Premier League referees have come under unprecedented scrutiny this season. The season now heads for the business end of the league and a period that Sir Alex Ferguson fondly refers to as “squeaky bum time”; and the scrutiny of referees cannot be more intensified. Rightly so, their decisions can make or break a team. It is those split second decisions that can make the difference between promotion and relegation, a Champions League or Europe League spot, etc. In spite of all the hoo-ha that has gripped the League, it is the Balotelli enigma that seems to stand out in my view; especially in a season that is too close to call. Balotelli, the Manchester City striker has been described variously from eccentric, stupid, enigmatic, gifted, extrovert, to charismatic; take your pick. But it is his unpredictability on and off the pitch that makes him stand out. In the eyes of many, he may justifiably fit into all these descriptions but the underlying issues seem to escape the radar of his arm chair critics. This piece is an attempt to give an alternative view of the man himself, and should not be mistaken for a psychosocial assessment. As a package, he displays the kind of arrogance that we have come to associate with Eric Cantona. His Cantona-esque arrogance is elegantly blessed with the genius similar to one time darling of English football Paul Gascoigne. He has the drive and will to win, hence like Paul Scholes and Wayne Rooney, you always hold your breath when he loses possession and tries to regain it. You know that it will surely end in a foul against him as we saw in the game against Tottenham Hotspur; an incident that became a cause for retrospective decision by the FA and a four match ban. But beneath this veneer of genius is an apparent psychological battle, and a trip to his background may just give us a glimpse of the internal rumblings of his mind set. He was born in Palermo, Sicily to Ghanaian Immigrants Thomas and Rose Barwuah. He is reported to have developed some medical problems which forced his struggling parents to ask for help from the Social services. At the tender age of three, the Barwuah family agreed to entrust him to Francesco and Silvia Balotelli. His biological parents asked for his return later but Balotelli reportedly accused them of “glory hunting”, stating that they only wanted him back because of the prominence he had gained. Fast forward to his introduction to the international stage, he opted to play for Italy, after gaining his citizenship on his 18th. birthday, despite repeated courtship from the Ghanaian national team. Balotelli has since been accused of turning his back on his country of origin in some quarters. If his alleged accusation of his parents is anything to go by, then it is plausible to assume that it also reeked with anger. He may have felt abandoned by his family; who in fairness may have had genuine mitigating circumstances to entrust him with the Balotelli family. But to a young man of that age, the sense of abandonment and feelings of being unloved could not be more ably manifested. It is plausible to conclude that he may have harboured deep seated anger; feelings which seem to surface having been thrust into the limelight. With this feelings bubbling beneath his latent talent, you would think that Balotelli would get the love he never had from his brethren of his adopted country. But sadly for him, he became the victim of vitriolic racist chants from Juventus fans after he scored for Inter Milan in a 1-1 draw in April 2009. Although Juventus club was fined and given a one game home fan ban, the chants which included “Black Italians do not exist” continued even during games that did not involve Mario or Inter Milan. The racist chants did not stop at club level but was also taken to the international stage. Mario was constantly booed by his own “Italian” fans even when he donned the country’s colours and scored for them. He was never regarded as “one of them”. There is no suggestion that Mario was an angel while playing in Italy. As an Inter player, he was spotted wearing the jersey of arch rivals AC Milan on the Italian show Striscia la Notizia. He was also known to have a catalogue of disciplinary problems with his then Manager, Jose Mourhino. Without offering any excuse for Mario, it is understandable to see how such a young man, who feels abandoned from his early years but seeks some emotional refuge from his adopted country; only to be reminded that “you are not one of us”. Added to the equation is the attention and spotlight, where every aspect of his life is scrutinised tenfold; his crime? being a wonderfully talented footballer. Balotelli would have thought that moving to greener and newer pastures would sound like a new challenge and hope for some acceptance. In comparison though, black players fair better in the racism continuum in the English leagues than their Italian or Spanish counterparts; thanks to the zero tolerance approach from the FA, the fans, Clubs, schools, kick it out and other anti-racism groups. Since his arrival to the Premier League, a lot has been attributed to him, ranging from the philanthropist, the prankster, the eccentric to downright irresponsible. Suffice it to say that he has been seen as the good, the bad and the ugly. He was involved in a car crash and when asked why he was carrying so much cash (£5000) by a police officer, he reportedly said “because I am rich”. His pranks include throwing a dart at a youth team player, confronting a bully on behalf of a young Manchester City fan, turning his garden into a racetrack for quad bikes, giving £1000 to a homeless man, visiting a female prison, buying £1000 round of drinks for punters in a pub, and donating £200 pounds to a local church. It must be emphasised that most of these stories have been denied by his management; well the bad bits. But this gives us a plausible insight into the enigma that some people have come to love or hate. While some see him as a lovable rogue, others see beyond the exterior and accept him for what he is. Like him or loathe him, Balotelli brings a lot of colour to the football seen. But beneath that veneer of talent, there is no mistake that like his talent, there is latent anger. When he scored twice to record Manchester United’s heaviest defeat (6-1) at the hands of their rivals this season, he unveiled his shirt with the words “why always me?” on it. His face was stony and iced at the time. He had a good game but was not in celebratory mood. Those words have become legendary to Manchester City fans as they seem to outsell other replica shirts. If anyone wanted to get an idea of the workings of Balotelli’s mind, those words cannot be more telling. The words seem to suggest a siege mentality and a proclamation that the world is against him. 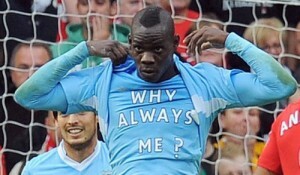 But is Balotelli right to feel that way? Some analyst may agree with him, considering his early years, right up to the sense of feeling unwanted by the fans of his adopted country. Others might even suggest an evidence of identity crisis, resulting in split personality. As mentioned earlier, this piece is not an attempt or pretence to psychoanalyse Mario Balotelli. He has the genius of Paul Gascoigne, the will to win that we associate with Wayne Rooney and the Gaelic arrogance of Eric Cantona. With such a combination, you can be least expected to expect nothing less or more from him. The only thing missing is an upturned collar whenever he scores; like the legendary Cantona. Love him or hate him, Super Mario is just superb. But how do you solve such a problem? His precocious talent is there for all to see. What Balotelli needs is an Alex Fergusson that will set him boundaries and shower him with a fatherly love, the occasional arm round his shoulders. A Glaswegian code of conduct will go a long way to shape and allow him to bring his potential to fruition. He needs a Fergusson that will protect and defend him in public and from the public, but will get the full hair dryer treatment in private. At 21 years old, this guy needs all the love he can get; but with a hint of Spartan ingredient. This is no suggestion that Roberto Manchini is mis managing him. Many people believe that if Paul Gascoigne had received his tutelage from Sir Alex Ferguson, he may have been one of the greatest players to have graced the premier League. You decide but there is enough evidence to make it difficult to dispute this. Love him or loathe him, he has the potential of a very good footballer. We only hope that he does not self destruct as a result of the twin problems of anger and public pressure. Balotelli needs someone that can imbibe the self belief, self awareness and the rudimentary efforts to channel his anger into his football; preferably aimed at the opposing team’s goal. He may not be the finished product but a fatherly figure in his relatively tender football years will not go amiss. As for the baying public, please let him is as its time to get off his back. In case you are wondering, I support a team in Manchester, and it’s not in the City. Don’t forget the lights, please.